Paradox Sports believes in total organizational transparency. Below is an overview of our general policies and program efficacy. Governance & Evaluation: Paradox Sports Board of Directors (details) provides guidance and strategic oversight of the organization. Donor Privacy: It is our policy to never share or sell the names, addresses, phone numbers, or email addresses of our donors. Medical Information and Applications: Paradox Sports’ physical, network, and process security protocols are fully compliant with the Health Insurance Portability and Accountability Act (HIPAA). Only relevant health details are shared with Paradox Sports’ lead staff and guides to ensure safe, tailored, and inclusive programming. Click here for more information on HIPPA. Diversity and Inclusion: We believe that our commitment to diversity and inclusion builds a stronger Paradox Sports community. 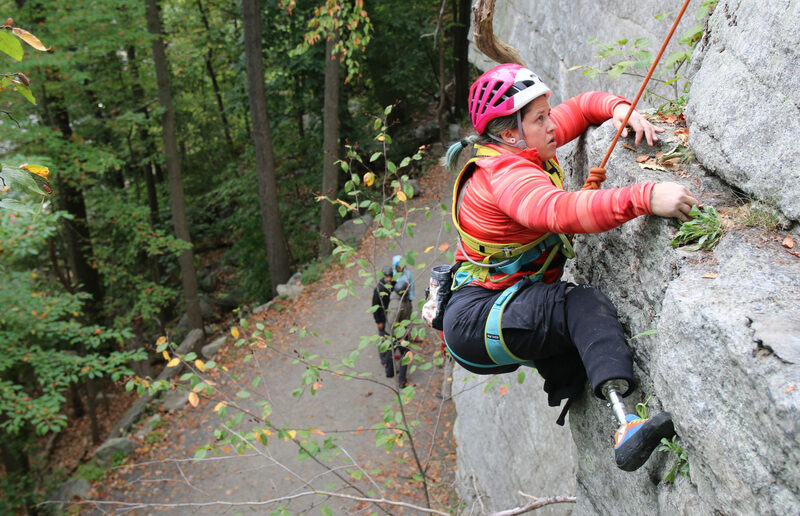 By providing adaptive climbing opportunities to people with disabilities, we strive to bring climbing to all. The Sites contain links to the websites of other companies and third parties. Paradox Sports is not responsible for the content, practices, privacy policies or terms of usage of those websites. Making a Donation: First off, thank you. Paradox Sports is sustained by the generosity of our family of donors. By making a gift, you’re helping transform lives. In order to complete your donation, we collect information associated with your credit card to bill for payment, including your name, address, phone number and other identifying information reasonably necessary to complete the transaction. Newsletter: We offer a periodic newsletter to voluntary subscribers. You can subscribe to the newsletter by telling us you want to subscribe to it using our contact information at the bottom of the website. As part of subscribing, we collect your name, e-mail address, mailing address and other contact information. You may be asked to provide other information in connection with specific programs, or more generally about your interests, so we may specifically tailor our communications with you. This information is not sold, given, or shared with any unaffiliated third-party and is only used to update you with new products, events, or other Paradox Sports news. We encourage all of our subscribers to share these newsletters with their friends and we are open to ideas for what you would like to see in them. If you ever decide you wish to no longer receive the newsletter, you can always unsubscribe. Information Requests: You may be asked to provide personally identifiable information so that we may respond to your requests for information made through the Sites, contact forms, or when contacting us personally through our contact information listed at the bottom of the website. Non-Identifying Information: Non-identifying information related to operating systems, browsers and linking IP addresses are collected to optimize your interests, preferences and experience on the Sites. Paradox Sports may collect and share aggregate website statistical information with third parties. No such shared statistical information will contain any personally identifiable information. Cookies; IP Address: Text files stored in your web browser, or “Cookies,” allow us to collect information about your use of the Sites. Cookies are used to recall your personally identifiable information, including user registration, to customize your use of the Sites. Cookies identify you when you visit our Sites, so you can put items in your shopping cart and place your order. You need to have Cookies enabled in order to shop online at the Sites. If you have disabled Cookies in your web browser, you must place your order via phone or email. (Each browser has its own method of enabling and disabling cookies, so check the “Help” menu of your browser to learn how to change your cookie preferences.) Cookies are also used aggregately to track user patterns on the Sites to help us improve the user experience. Our web servers also collect information about your connection to the Internet, including your IP Address. Your IP Address does not identify you individually; however, we use your IP address to optimize the Site experience, to administer and improve Site functionality and to diagnose problems users may encounter. Paradox Sports also uses your IP Address to determine navigation routes to the Site. Control of Information: Paradox Sports may contact you with information concerning products, services or promotions; however, you always have the choice to unsubscribe from such communications. You may contact us to manage your marketing preferences and to request removal from marketing lists at the address provided below or through “Contact Us” within the Sites. Additionally, marketing communications from Paradox Sports will contain an opt-out or unsubscribe mechanism allowing you to change your marketing preferences. If you decide not to receive communications from Paradox Sporst, we may continue to use your personally identifiable information in order to communicate with you regarding transactions, products and other information of an informative nature. Sharing of Information: Paradox Sports will not sell or rent your personally identifiable information to non-affiliated third parties for marketing purposes. Paradox Sports may share your personally identifiable information with affiliates or representatives with whom Paradox Sports maintains a business relationship. Paradox Sports may hire third parties to provide services on its behalf, which may entail the use of personally identifiable information. Such third parties are required to maintain the confidentiality and security of personally identifiable information they receive from Paradox Sports. They are restricted from using personally identifiable information for any purposes other than those authorized by Paradox Sports. Other than as described above, Paradox Sports will not share your personally identifiable information collected on the Sites with third parties without your permission, except as is reasonably necessary: (i) to complete a transaction, (ii) to respond to a direct inquiry, (iii) to register you for communications and promotions that you request, (iv) to comply with any federal, state or local law, court order or proceeding that is legal in nature; or (v) to enforce an agreement with you, to protect the interests of Paradox Sports, its affiliates or representatives with whom Paradox Sports maintains a business relationship, or as is otherwise permitted or compelled by law. In the event of a transfer, merger or reorganization involving Paradox Sports, your personally identifiable information shall be transferred to the acquiring company. SSL Encryption: When you submit personally identifiable information through our Sites, including credit card information, the data is transmitted using secure sockets layer (SSL) encryption technology. However, no electronic data transmission can be guaranteed as 100% secure. While Paradox Sports strives to protect your personally identifiable information during transmission, we do not warrant the security of any information you transmit to us or receive from us. Unsolicited Submissions: Communications or suggestions made by you through the Sites which are not by their nature intended to be confidential, shall be deemed to be non-confidential. Paradox Sports will have no obligation of any kind with respect to such communications and shall be free to use and distribute them to others without limitation, including, but not limited to, their use for marketing purposes. Children Under 13: As a nonprofit organization aimed at providing adaptive climbing opportunities for people with disabilities, and in order to comply with the Children’s Online Privacy Protection Act, Paradox Sports does not intentionally market to children under the age of 13, the Sites are not intended for use by those under the age of 13 and Paradox Sports does not intentionally collect personally identifiable information about children under the age of 13. If you are under 13 and would like to purchase products through the Site, please ask a parent or guardian for assistance. If you are under the age of 13, please do not submit any personally identifiable information to us.